If you have been working in Singapore recently, there has probably been one phrase that popped up more frequently than ever – itemized payslips. A term that simply complemented your payday has now gotten more sophisticated, more regulated and more complicated. So what exactly is the fuss over itemized payslips? And how does it affect Singapore businesses and its employees? What exactly is an itemized payslip? A MOM legislation compliant itemized payslip. Why is this a hot topic in Singapore? For mainly one reason which is that the MOM made it mandatory for all employers to provide an itemized payslip for their employees effective May 2016. The government mandated that all itemized payslips include 12 required items. Also, it is compulsory that information of current employees and ex-employees are stored for up to 2 years. This created much dispute when the policy was first introduced. Many local SMEs, and human resource departments voiced out that such a mandatory law would drive up the already increasing manpower costs, effort and workload for HR teams, and ultimately be a significant expense issue for SMEs. This delayed their implementation for 2 years to allow the companies to adapt. But now that the policy is fully in play, Singapore’s businesses have to care about it unquestionably. 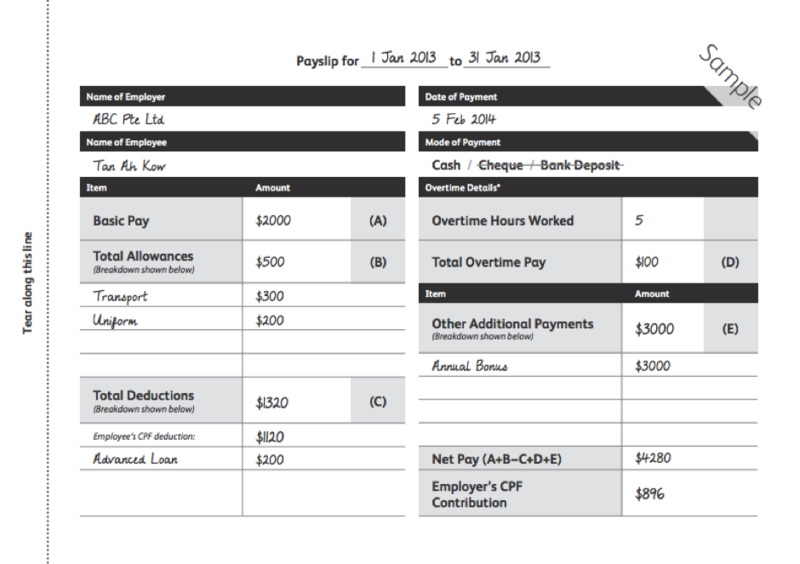 How exactly then does an itemized payslip benefit Singapore? At its core, it is a policy that is designed to improve the overall welfare of Singaporeans, for both businesses and workers. For employees, itemized payslips provide security and assurance regarding their standard pay and employment perks. This ensures that workers do not get short-changed or be subject to irresponsible employers. And for employers, complying with this newly reformed Employment Act policy allows businesses to stay out of trouble and minimize employment implications with the MOM. More importantly, this reduces the problems of compensation disputes for employees, and related issues concerning benefits and privileged perks. When everything is mandated and clearly stated in black and white, the occurrence of unjustified complains filed by employees is minimized and responsibility on the employers end is upheld. How does this affect SMEs and HR teams? For businesses and HR departments, the new standards required more time, increased workload and associated expense costs. Traditionally, Payslips had provided simple pay stubs that reflected the employee’s pay and deductions, but 90% of local SMEs did not meet the MOM’s guidelines. With this change, an entire set of new problems arose for HRM professionals. Payment issues especially with part-time employees were hard to regulate month to month due to its arbitrary nature, and some owners also pointed out that relatives and close friends who were employed did not find itemized payslips a necessity. Many HR employees would need to be retrained to learn the new policy in place and the changes that came along with it. This requires increased expenses and time to educate the staff involved on itemized payslips. Most explicably, the whole aspect of requiring to manually manage each employee’s full payslip monthly became a nightmare for larger companies with a high number of employees. And to top it all off, any non-compliance with this policy would be considered a civil law violation. First offences would put businesses liable to a fine of up to $1000, and repeat offenders liable to up to $2000 for consecutive breaches. All in all, this did not paint a very bright picture for employers, businesses and human resource management employees. How are local businesses coping with the new regulations? As with every disaster, there comes in a rescue team. To aid local SMEs and HR departments, this presented an opportunity to tap on technology start-ups focused on reinventing the HRM software industry. These new start-ups, also known as HRM SaaS services, have found success in helping businesses meet the government’s new legislation requirements in a timely manner and they do not just stop there. They are reinventing the system using technological advancements to automate all things related to payslips and human resource management, making the process simple and easy for both employees and employers. HRM SaaS consolidates all the payroll data and related employee information safely and securely. Fully automated payroll system for businesses within a fraction of the time previously needed by manual HRM processes. What does this mean for Singapore Businesses? With this new Employment Act revision, employees now receive the privilege of a secured and reliable pay system. They understand clearly where and how their money is coming in, and employers cannot short-change them of their perks and benefits by mistake. For Singapore businesses, this indicates a stricter and regulated system to follow, but not without any assistance. With the aid and introduction of new HRM SaaS platforms that automate and manage payroll processes for companies, SMEs have little to worry about with or without the legislative changes. Conclusively, this is a win-win for businesses and individuals, a gracious collaboration between the public and private sectors.